One of the easiest ways to ensure that your organization’s culture is customer centric is to create visibility into feedback across all levels of your organization. To do this, you can use your spare AskNicely seats to invite members of your executive team. With their active seats in AskNicely, they can directly participate in conversations with customers and receive regular email reports based on specific segments of your data. You can create these automatically emailed reports by using the “saved view” feature in AskNicely. Filter your dashboard by the data that is of most interest to you, and then create a saved view by clicking the bookmark ribbon icon above your organization’s logo. 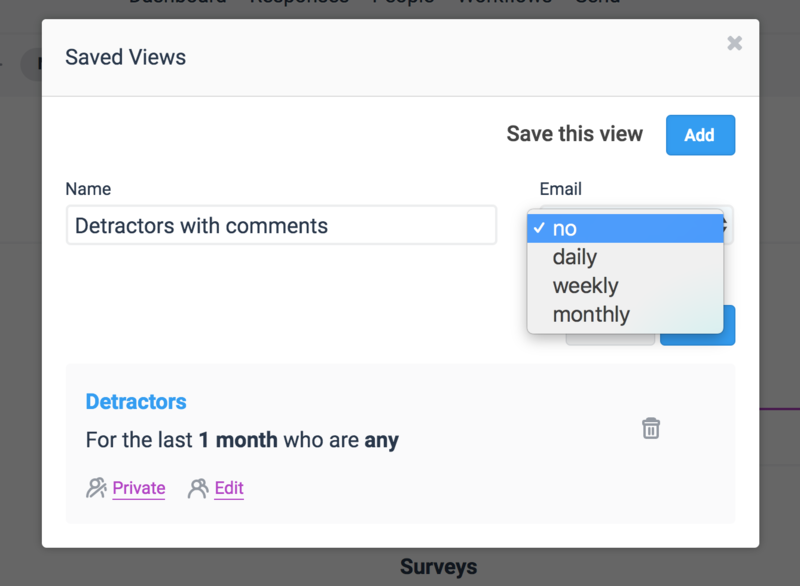 This will allow you to name the saved view, share it across your organization, and subscribe to a daily, weekly, or monthly email digest. Your executive team can subscribe to saved views that they find relevant; for example, they may be curious as to the NPS across your VIP clients, or the NPS as it pertains to a specific team.